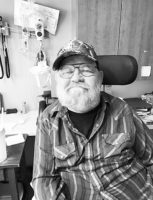 Our devoted father, husband, grandpa and friend always putting others first, Duane Stevens, 67, died June 18, 2018, at Rangely District Hospital. He was born June 1, 1951, in Rangely, Colo., to Dolores “Ed: Polhamus and Red “Midge” Stevens. He married, Judy Mansell Stevens. Duane loved his family, he was a truck driver and spent many hours in his semi. He enjoyed camping, fishing, hunting in the beautiful mountains. He was always helping people, laughing and very kind-hearted man. Thank you, to all who loved and cared for him, Rangely District Hospital staff, and family and friends who have loved, supported and helped us through this difficult time. Survived by his children Colby Stevens of Vernal, Utah; Chelsea (Nate) Polley of Rangely, Colo.; Charlie (Mike) Hadsell of Casper, Wyo. ; 10 grandchildren; brothers Rodney Stevens, Carl Stevens, Evan Stevens; sisters Jeanie Stagg and Karen Scott. He was preceded in death by his wife, parents and brother Gary Stevens. Graveside services were conducted on Friday, June 22, 2018, at 2 p.m. at the Rangely Cemetery in Rangely, Colo. A viewing prior to the services was held at the Rangely LDS Ward Chapel from 12:45-1:45 p.m. prior to traveling to the cemetery. Burial was under the care and direction of the Blackburn and Sons Vernal Mortuary and Cremation Care. Send condolences online to family at www.blackburnvernalmortuary.com.